Note: Amy accepts requests for custom jewelry, hobo nickels, knives, & engravings of all types. Bracelet is 5/8" wide & 16 gauge in thickness. It is Hand Engraved with Floral motif & running scroll design. Note from Webmaster: The picture to the left does this lovely work of art no justice. Please click on the bracelet to see a larger image. You will love it! 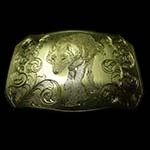 This brass buckle is beautifully engraved with a stalking wolf. The intensity in the wolf's eyes, the lowered head, and the captured movement of its legs brings this work of art to life. This buckle should be called "The Struggle Of Life" in my (webmaster's) opinion. Pendant in Stainless Steel with hand engraved knotwork & inlaid with 24 Karat solid Gold. Pendant is 29mm in diameter. A small resting fox is engraved on a 29mm Stainless Steel Pendant using the Bulino style. The fox is surrounded by a leaf border. Another example of Bulino Style engraving. 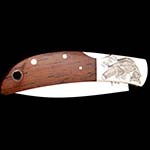 This Red Fox is engraved on an Al Mar knife with Cocobolo handle. Stunning !!! This stunning piece of jewelry is a bracelet that measures 5/8" wide & was formed from 16 gauge sterling silver. The engraving on this bracelet was done by hand and is bright cut style. The images that are central to the design are 3 celestial symbols, the sun, the moon, and stars. It has a fandango border & scroll center, and it weighs in at approximately 1 ounce. Look at the enlarged photograph and you'll be amazed by what you see! Border: This stunning piece of jewelry has a fandango border & scroll center. Look at the enlarged photograph and you'll be amazed by what you see! This beautiful pendant is made from 14 karat yellow gold and is in the shape of an open heart. The heart measures 21 x 19 mm and is 20 gauge in thickness. A 4 mm round cabochon cut Mozambique Garnet is bezel set and dangles freely in the heart center. The heart pendant is hand engraved with a running leaf border and milligrained edge. This gorgeous pendant would make the perfect holiday present! This beautiful sterling silver cuff bracelet is 5/8" wide, has a 16 gauge thickness, and weighs 19.7 dwt (pennyweight), or just under 1 ounce. The bracelet is engraved with a running scroll design. The background is relieved and stippled. This Celtic Cross is hand engraved on a 23.75mm 16 gauge thickness round sterling silver pendant. The Cross is engraved in a Celtic knot style. The cross is surrounded by an inlaid 24 karat yellow gold partial border. A .03 carat round diamond is set in center of the cross. The background is relieved & lightly stippled for a nice contrast. Celtic Crow is hand engraved on a 23.75 mm round 16 gauge thickness sterling silver pendant. This crow carving is seen with one foot lifted from the ground, head turned to allow a view of what is behind it, surrounded by a celtic knot border with the Cardinal directions, North, South, East, and West, represented by 24 karat yellow gold diamond shapes. This beautiful piece of hand-crafted jewelry is relieved and stippled. A silver 1944 Mercury Dime carved into a skull leaving most of the original features of the coin untouched. Dime is set in a sterling silver coin bezel with sterling silver pendant bail. Pendant is a Hand Engraved Celtic Trinity Knot. Pendant is sterling silver, 21mm diameter, 16 gauge in thickness. The Celtic Trinity Knot is Hand Engraved. The background is relieved (removed) & stippled. A silver 1939 Mercury Dime is carved into a skull with scroll background. Dime is set in a sterling silver coin bezel with sterling silver pendant bail. Die-hard (diehard) Red Sox Fan is part of the Die Hard Fan Series. Carved on a Buffalo Nickel is a skeletal profile wearing a twisted ball cap. The ball cap has a 24 karat yellow gold Boston "B." Each coin is hand carved to order on various common date Buffalo Nickels. The coin is mounted in a sterling silver coin frame for pendant. Die-hard (diehard) Red Sox Fan is part of the Die Hard Fan Series. Carved on a Buffalo Nickel is a skeletal profile wearing a twisted ball cap. The ball cap has a 24 karat yellow gold Boston "B." Each coin is hand carved to order on various common date Buffalo Nickels. Die-hard (diehard) Yankees Fan is part of the Die Hard Fan Series. Carved on a Buffalo Nickel is a skeletal profile wearing a twisted ball cap. The ball cap has a 24 karat yellow gold New York "NY." Each coin is hand carved to order on various common date Buffalo Nickels. $575.00 14 Karat Yellow Gold Floating Heart Pendant, including a 14 Karat Yellow Cable Chain, approximately 1.5mm diameter, (as shown in picture) your choice of 18 or 20" length.